Bangkok Chinatown has to be one of the most fascinating and captivating districts in what is possible and probably equally considered one of the most exciting and vibrant cities in the world. This particular area of Bangkok was once the financial centre of the city, but today and every other day, it's a thriving and bustling marketplace, if not somewhat flirtatiously overcrowded, noisy and frequently and horrendously congested at the best of times. In other words, this could, without a doubt, be the best place to either lose or find yourself in the moment. Chinatown in Bangkok is located between the two traffic-choked thoroughfares of Yaowarat Road and Charoen Krung Road where you'll find a labyrinth of narrow alleyways which for the most part are packed with lively market stalls. The most accessible being the wholesale fabric market on Sampeng Lane and the diverse offerings provided by the vendors along Soi Lsara Nuphap. There are three other major markets around Chinatown, but I will get to them shortly. 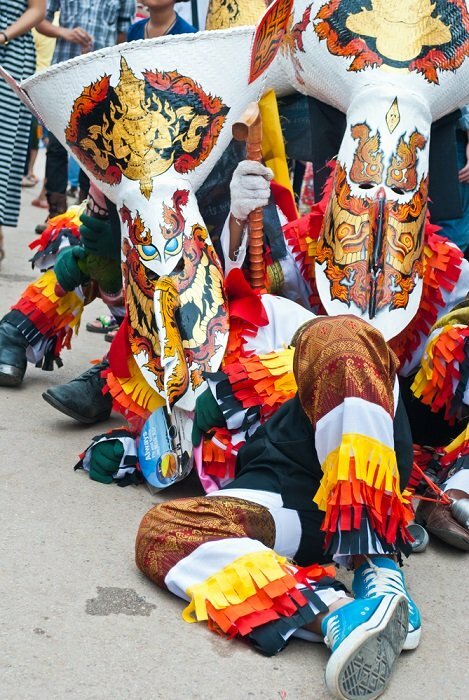 They are namely the Pak Khlong Market, the Phahurat Market and the Nakorn Kasem Market. During the 18th century, many Chinese communities and their merchants who had settled in Bangkok, originally occupied land in the old royal city where the Grand Palace is today. In 1782 King Rama I decided to establish the capital on the site once inhabited by the Chinese and asked the traders to move. They then settled east of this new city along the Chao Phraya River around Sampaeng Lane and Songwat Road. It's hard to believe that the narrow street of Sampaeng Lane was once the main road in Chinatown. There is little room for cars and pedestrians to pass. In 1863 King Mongkut built the new Charoen Krung Road. It was to become the first paved street in Bangkok and this allowed the local community to amplify northwards towards it. Charoen Krung Road runs about 6 kilometres (4 miles) from the Grand Palace southwards towards the river where it terminates, just south of the Krung Trep Bridge. In 1902 the foreign community, who had settled on the river further east of Chinatown, petitioned the king for a larger road. And as a result, Thanon Yaowarat was built between Sampeng Lane and Charoen Krung Road, becoming the principal road of Chinatown. It is also the name which this area is frequently known, Yaowarat. Chinatown is home to many examples of the architecture of Bangkok's early years. About 14% of the buildings here have been designated as historical landmarks. Most of them are off on side streets. Bangkok Chinatown lies south of the Dusit area, east of the old royal city and on the north side of the Chao Phraya River. Getting there is effortless. You can take a taxi or if you sense a need for adventure, a bus to Charoen Krung Road. Stop anywhere along the route and spend your day wandering around the stalls. You can also take a leisurely riverboat ride on the Chao Phraya Express and ask to disembark at the Ratchawong Pier or catch the train to Hua Lamphong Station. The district around Chinatown also runs along Yaowarat Road from Odeon Circle, where a huge ceremonial Chinese gate unmistakably signifies a grand entrance, and then right up to the Khlong Ong Ang Canal, which marks the outer boundaries of this royal region. Taking a cycle tour such as the one above is a wonderful opportunity for you to explore the bustling Chinatown area before crossing the Chao Phraya River to see more serene and often less visited temples and sites of Thonburi. You'll get to ride along the quiet back roads of this area, stopping at the occasional market as you head to the Princess Mother Memorial Park and Museum. While the memorial park and museum might be small, it's extremely well kept and well worth a visit. This is a 15 kilometre (9-mile) ride that is suitable for any level. I've got you covered if you'd like to see a few more Chinatown Tours including a Hidden Chinatown Tour as well as a Fun Foodie Tour. Yaowarat Road is also one of the main traffic arteries, and the bustling street is packed with gold shops, herbal sellers, cafe's and restaurants and just about anything and everything else. If you want to buy gold jewellery, albeit Asian gold, then this is the best place to shop. Devote a whole day in Chinatown, interact and chat amongst the locals. You'll be pleasantly surprised how friendly the atmosphere is here and you need not have to worry either, it's perfectly safe too. Precautionary assurance is all you require. Remember that pickpockets are everywhere and in every major city so it's always wise to keep your valuables close at hand. Thai food is in abundance so if you are feeling a little peckish and just want to snack on something, then go ahead and sample the delicious variety that abounds. There are also lots of restaurants for you to enjoy both local as well as international cuisine. There really is no rush. 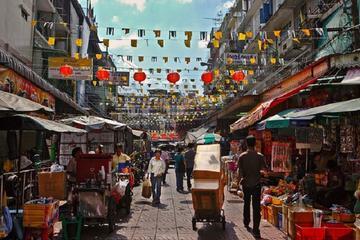 Pak Khlong Market is situated on the outskirts of Chinatown on Soi Tha Klang and is open 24 hours every day. This market provides the city with a vast array of fresh flowers and vegetables. It's a one stop florist's dream and is well known for offering the best flowers in all of Thailand. Here you will find a display of the freshest roses, orchids, Jasmine and lotus as well as some exquisite Dutch tulips. The right time to catch these blooms at their best is during the early morning hours before 9:00 am. You can purchase single units, bouquets, floral baskets or whatever else takes your fancy. There is just no limit to what you will find here. Phahurat Market is predominately an Indian market with sights and sounds of a typical Bombay street scene. Market stalls around here are in a permanent flux of hustle and bustle with the main bazaar spilling out around Phahurat and Chak Phet roads. Apart from being the main wholesale fruit and vegetable market in Chinatown, many merchants here appear to specialise in apocryphal fabrics. The diverse street level traders sell everything from tablecloths to wedding saris. If you step upstairs and wander around the dimly-lit sections, you'll find loads of traditional Indian accessories from ornate jewellery to delicate sandals. Need something to eat... No problem! There's certainly no shortage of food here. In the surrounding streets, there are plenty of hole-in-the-wall Indian Restaurants and samosa stalls, creating an array of appetisers to suit all taste buds. Nakorn Kasem Market is situated on Charoen Krung Road on the western edge of Chinatown and popularly known as the Thieves Market because stolen goods were once allegedly traded here. A few decades ago, householders would go in search of their stolen goods in this area after being robbed, as it was the most likely place they might recover their items for a much more reasonable price. Believe it or not, householders who had their stuff snatched also had no way of identifying their stolen property so in order to retrieve their goods, they had no alternative but to repurchase them. It's madness. Anyway, there is scant need for concern as this market has since discarded its illicit past and has now a miscellaneous collection of Chinese Shop-Houses selling everything and anything from a wide range of ornaments and prosaic household goods to antiques, metal-ware and musical instruments. Hopefully, these goods are legal. The Chinese Shop-Houses are very much a common feature in Chinatown. Families here are known for running their businesses from the ground floor while living on the first floor above their shops. An interesting market near Nakorn Kasem is Saphan Han Market. It's a covered market situated on both sides of the Khlong Ong Ang (a narrow waterway off the Chao Phraya River). Specialities here are electrical goods of every description as well as a variety of household items - and inescapably, lots of pirated goods, too many to mention. This area is frequently filled with mostly locals who come here to pick up bargains at the vast variety of stands and stalls. It is also where good cheap food is aplenty and most noticeably, you cannot help but catch hold of your breath from the aroma that waffles in the air from all the copious noodle bars around here. The photo above shows a young Thai lady scooping up what appears to be some sort of sticky stuff that closely resembles that of tar. What she is doing, in fact, is preparing to make a refreshing black jelly drink known as Chao Kuai. This tar-like substance is made from grass jelly, a dessert served with crushed ice and syrup. Grass jelly is formed when one blends slightly aged oxidised stalk and leaves from a member of the mint family called Mesona Chinensis with potassium carbonate and a little starch. The black matter you see here is the end product produced by boiling all the ingredients together for several hours and then allowing it to cool. The translucent black jelly can be cut into cubes or various other forms and then mixed with water and brown sugar to produce a drink, thought to have cooling properties. It is ideally consumed during the hot weather in Thailand. Chao Kuai has a slightly bitter taste and a light iodine lavender flavour, but with a little added sugar, it becomes refreshingly palatable. It can also be served with fruit such as the Jackfruit or mixed with soy milk to produce a milky white liquid. Chao Kuai is often served in clear plastic bags as are many other cool drinks that are sold in the markets of Bangkok. This is a preferred Thai takeaway option but you can request your drink be accommodated in a plastic cup should you so wish. Wat Traimit is a white and gold temple well worth visiting while in Chinatown. Seated in the grand temple's interior is the world's largest solid Golden Buddha weighing five and a half tonnes. The Buddha was discovered purely by accident in 1955 at a nearby riverside temple during construction to extend the dock there. The temple is situated just east of the point where Yaowarat and Charoen Krung roads meet. 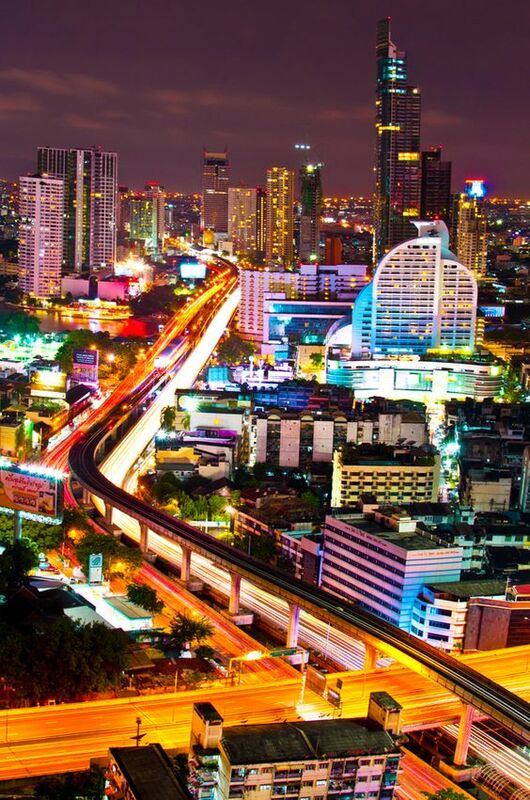 It is also within walking distance from Hualamphong Railway Station, the railway link that connects Bangkok with the rest of the country. The temple is open daily from 8:00 am until 5:00 pm with an entrance fee of just 20 Baht.